Somehow, all these years later, that “dark speck” has stuck with me. Elisa Allen lives in the beautiful but cloistered Salinas Valley. As the story opens, she wears a man’s black hat pulled down low and her “figured print dress” is obscured by a large corduroy apron filled with gardening tools. She is strong and confident, yet life prevents her from enjoying the more exciting work of her rancher husband and his friends. Instead, she must take all that strength and skill and invest it into cutting and replanting last year’s chrysanthemums, a skill for which she is rightly proud. Initially, when her gardening is interrupted by a tinker looking for work, she is clearly not interested — an uber-competent Elisa can fix her own pots and sharpen her own scissors, thank you very much. She’s not overly moved by his little speech about how he will miss supper tonight without the work. But somehow, when he notices and asks about her chrysanthemums, the “irritation and resistance melted” from her face. She returns his feigned interest with enthusiasm about the secrets of growing tall and beautiful chrysanthemums. It is right at this point that the hungry tinker sees his chance. He tells Elisa of a lady friend who can grow every kind of flower except a chrysanthemum. Elisa, eyes shining, insists that the tinker take this woman a pot of her sprouts in damp sand so she can transplant them. An animated Elisa explains how to care for them. In the process, she also finds a couple of abandoned saucepans for the man to fix, so that she might pay him a little something before he is on his way. Later, while her husband is driving Elisa into town for dinner, she sees it. 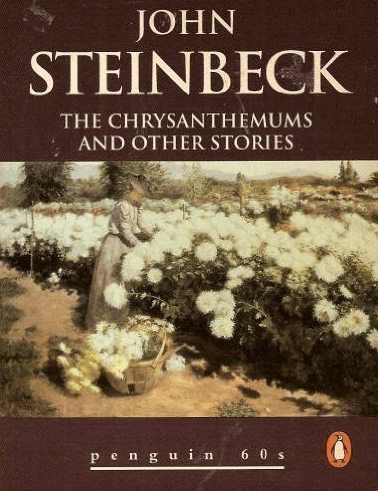 Steinbeck was prophetic, in my case at least — there is something deeply profound in this story. For all that it may have to say about gender and marriage and seduction and loneliness, I’m still drawn to that “dark speck.” What must it feel like to see that gift of vulnerable beauty, cravenly abandoned on a country road? A gift of grace, so casually tossed away? Sometimes grace must pay out twice — first in the gift, and then in the visible rejection of it. But somehow, I believe, the gift is not diminished, despite the tears. There is in that dark speck a beauty still, whose roots sink deeper than we can see, whose blooms will still blossom in the spring.